The Forgotten Kingdom: The Archaeology and History of Northern Israel. Ancient Near East Monographs 5. Atlanta: Society of Biblical Literature. La Royaume Biblique Oublié, Paris 2013. 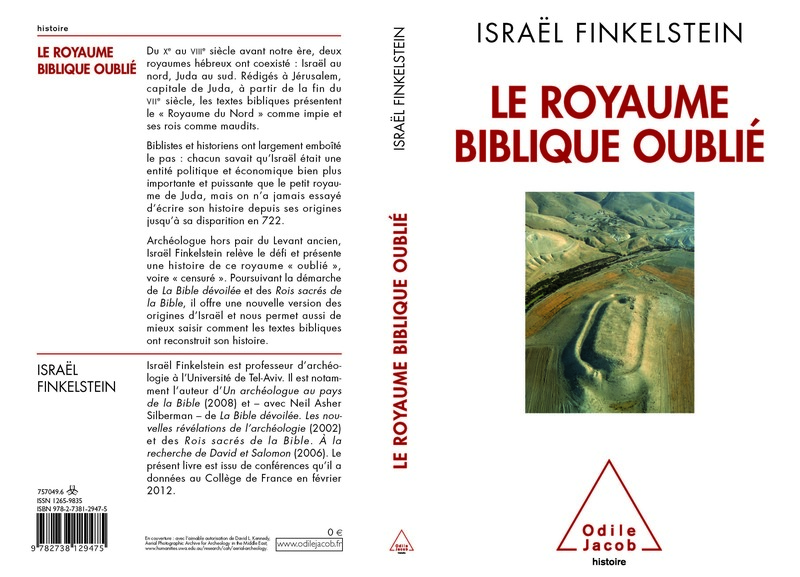 Un archéologue au pays de la Bible, Paris 2008 (collection of articles updated and translated to French). The Quest for the Historical Israel: Debating Archaeology and the History of Early Israel, Atlanta 2007 (Edited by Brian B. Schmidt). Megiddo IV: The 1998-2002 Seasons Tel Aviv 2006 (Monograph Series of the Institute of Archaeology Tel Aviv University No. 24). David and Solomon: In Search of the Bible Sacred Kings and the Roots of Western Tradition, New York 2006, The Free Press (A Division of Simon and Schuster). Inscribed in Clay: Provenance Study of the Amarna Tablets and other Ancient Near Eastern Texts, Tel Aviv 2004 (Monograph Series of the Institute of Archaeology, Tel Aviv University No. 23). The Bible Unearthed: Archaeology’s New Vision of Ancient Israel and the Origin of its Sacred Texts, New York 2001, The Free Press (A division of Simon and Schuster). Megiddo III: The 1992-1996 Seasons, Tel Aviv 2000 (Monograph Series of the Institute of Archaeology Tel Aviv University No. 18). Highlands of Many Cultures, The Southern Samaria Survey, The Sites, Tel Aviv 1997 (Monograph Series of the Institute of Archaeology Tel Aviv University No. 14). Living on the Fringe: The Archaeology and History of the Negev, Sinai and Neighbouring Regions in the Bronze and Iron Ages, Sheffield 1995, Academic Press (Monographs in Mediterranean Archaeology 6). From Nomadism to Monarchy: Archaeological and Historical Aspects of Early Israel, Jerusalem 1994, Yad Yizhak Ben-Zvi, Israel Exploration Society and Biblical Archaeology Society. Archaeological Surveys in the Hill Country of Benjamin, Jerusalem 1993, Israel Antiquities Authority. Shiloh: The Archaeology of a Biblical Site, Tel Aviv 1993 (Monograph Series of the Institute of Archaeology Tel Aviv University No. 10). The Archaeology of the Israelite Settlement, Jerusalem 1988, Israel Exploration Society. Izbet Sartah: An Early Iron Age Site Near Rosh Ha`ayin, Israel, Oxford 1986 (BAR International Series 299). Sinai in Antiquity, Tel Aviv 1980, Hakibbutz Hameuchad Publishing House (Hebrew).